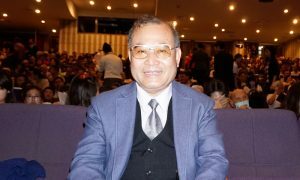 COSTA MESA, Calif.–Audience members were beaming with excitement opening night at the Segerstrom Center for the Arts, as world-renowned Shen Yun Performing Arts graced the stage April 12. In attendance was the Honorable Supervisor of the Orange County’s Second District, Michelle Steel. Prior to being elected to the Orange County Board of Supervisors in 2014 with more than 62 percent of the vote, she served as Vice Chair of the State Board of Equalization. Her popularity partly stems from her legacy as the state’s leading tax fighter. In 2008, she successfully led the fight against a new iTax, a $500 million tax on digital downloads. Due to her investigation, the State Board refunded tax security deposits to thousands of small business. “I just loved every bit of it. 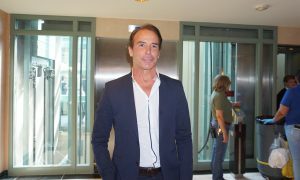 It’s so different, so I really enjoyed it,” said Supervisor Steel, after watching the performance. 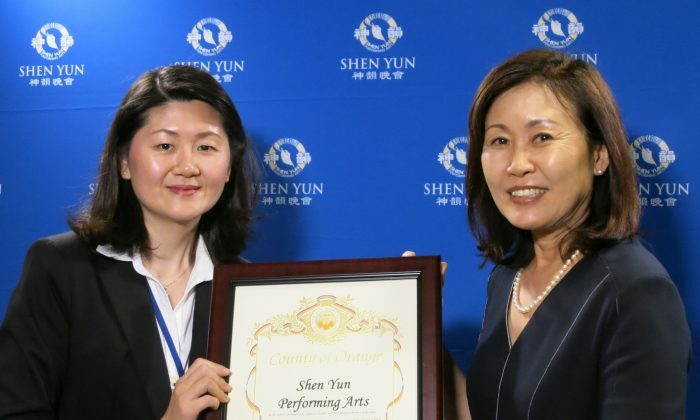 Her love for Shen Yun was publicly displayed when Supervisor Steel presented the Certificate of Recognition of Shen Yun Performing Arts for reviving and sharing traditional Chinese culture with Orange County’s audiences. Traditional Chinese culture is rooted in spirituality, and was deeply influenced by Buddhism, Taoism, and Confucianism. The ancient Chinese believed in harmony between heaven, earth, and humankind. But this culture has been nearly destroyed under the Chinese communist regime. 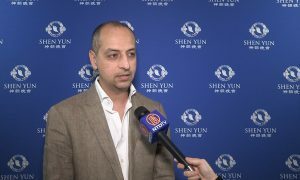 In 2006, a group of leading classical Chinese artists from around the world founded the independent, non-profit Shen Yun Performing Arts in New York. It aims to revive, and shares with the world traditional Chinese culture through storytelling dance and music. Every year, Shen Yun tours across five continents, reaching millions. 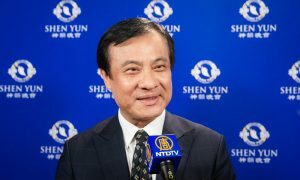 Despite receiving overwhelming, critical acclaim worldwide by artists and theatergoers, and having sold-out venues, Shen Yun cannot perform in China due to the communist regime’s censorship. But the Chinese Communist Party (CCP) does not stop there. Supervisor Steel was born in Korea and raised in Japan. She felt her Asian background helped connect her with the beauty of traditional Chinese culture. As a fighter for justice for California’s tax payers, Supervisor Steel fought for the rights of the people to see Shen Yun in Korea. She said, when Shen Yun artists could not get visas to perform in Korea a few years ago, she sent a letter to the Korean government, asking them not to play politics. 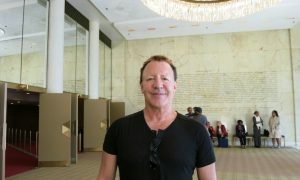 Supervisor Steel thought Shen Yun is really special, because many Asian Americans living in Orange County can learn about Chinese traditions portrayed through its performance. A Shen Yun performance consists of 20 vignettes that are accompanied by a digital backdrop to set the scene, a live orchestra consisting of a unique blend of Eastern and Western instruments to set the tone, and 400 original and handcrafted costume pieces. These are in brilliant colors and used almost in a prop-like way to adorn the dancers who perform classical Chinese dance, as well as ethnic and folk dances. It transports audience members on a journey through China’s culture and beliefs, where myths and legends come to life, and virtues such as bravery, compassion, kindness, loyalty and perseverance are personified. 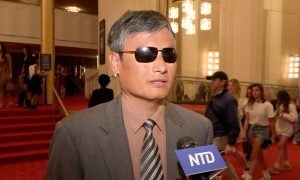 All aspects of Shen Yun’s performance delighted Supervisor Steel. She gave high praise to the performers for their beauty, grace, strength, discipline and synchronization. 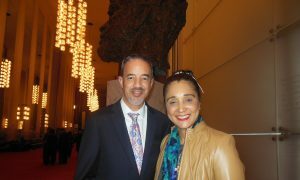 Supervisor Steele said she would encourage everyone to see Shen Yun, and thanked Shen Yun’s performers for giving her such a wonderful night.